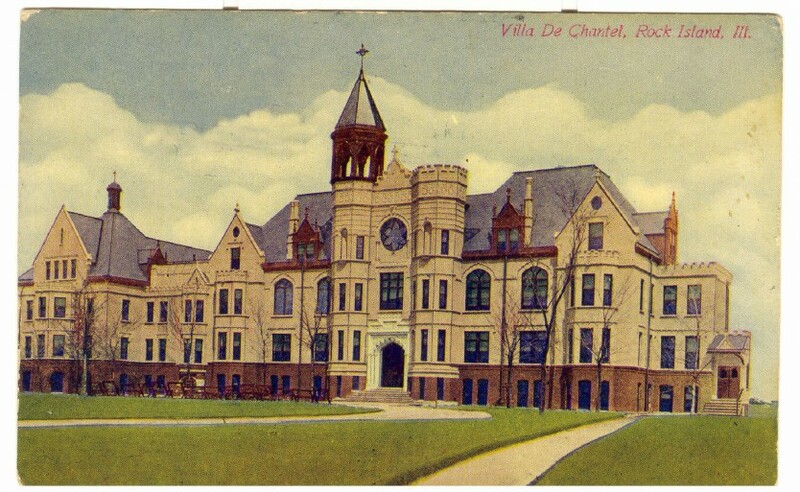 The Villa de Chantal, pictured in this circa 1912 postcard, served as a Catholic boarding and day school from 1901 to 1978. It was the vision of an order of cloistered nuns known as the Sisters of the Visitation who came to Rock Island from Kentucky, bringing with them a convent bell that would become a recognizable feature to the residents of central Rock Island for decades. The Sisters of Visitation came to Rock Island in 1898 and opened an academy on 5th Avenue across the street from Sacred Heart Church. The school was very successful and within two years it was clear that more space was needed. A bluff top piece of property was purchased and the process of raising funds for a new school began. The Gothic Revival style building pictured here was actually built in two sections. The oldest section is to the far left of the picture. It housed classrooms and living quarters for both the students and the Sisters. Within five years, the enrollment at the school had grown to 60 boarders and it was time for the large second section of the building to be built. It contains the ornate central entrance to the building along with a chapel, library, classrooms and private rooms for the boarders. Now the original structure would serve as the living quarters for the Sisters. In future years there would be further expansion adding an additional classroom wing and a chaplain’s bungalow. The first two buildings of the Villa de Chantal were designed by Rock Island architect, George P. Stauduhar. Stauduhar is known for his eclectic designs of homes, business structures and even steamboat interiors in the Quad Cities area. But he gained his wider midwest reputation through his design of Gothic churches. Over two hundred were constructed in the upper Mississippi River valley. The Sisters of the Visitation continued to operate the Villa de Chantal as a boarding school until 1959 and as a day school until 1978. In the early 1990’s the complex was sold and, for a while, there were the voices of young students ringing through the halls as it became home to Morningstar Academy. After Morningstar moved to new quarters, the Villa was vacant for a time, but work was starting to convert it to senior citizen apartments. Then in the early hours of July 14, 2005, neighbors were awaked by bright lights. The western and center wing of the Villa building was ablaze. After the fire was finally quenched, only the walls were standing. The easternmost wing, where the renovation has started, was protected by fire doors. However ultimately a decision was made to sell the property to the Rock Island School District, which demolished the remaining structures and built a new Science and Math Academy, which opened in 2009. This article by Linda Anderson is slightly modified from the original, which appeared in the Rock Island Argus and Moline Dispatch on June 24, 2001.